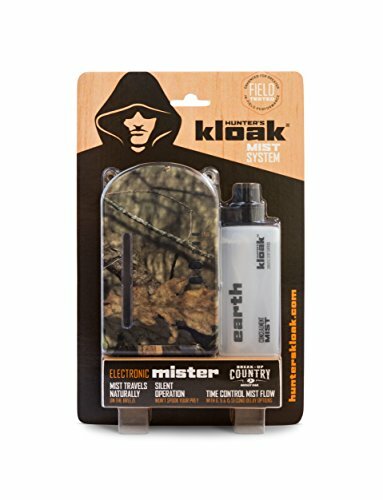 The Hunter's Kloak Gen 2 Kloak Mister offers a highly effective concealment and hunting scent attraction application to hunters in a reusable, rechargeable unit. The lightweight and compact Gen 2 Kloak Mister is designed to use scent cartridges that each employ a proprietary cotton wick that carries the scent to an ultrasonic transducer. The transducer converts the scent to a micro-fine mist, emitting it into the air at intervals selected by the hunter. The atomized mist is naturally carried downwind, broadcasting the scent for long-range attraction or cover-up. The 2.5-ounce cartridges are mess-free, easy to install, and are interchangeable while on the hunt. Simple to use operation. Select one of the available time delay intervals of 6, 9, or 15 seconds. The intervals can be easily customized to the conditions of the area being hunted and the scent cartridge being used. Use the provided USB cable to recharge the mister. The average battery life of a fully-charged battery is approximately 5.5 hours with a recharge rate of 4.5 hours to full charge. Each of the Hunter's Kloak scent cartridges last approximately 4.5 hours. The water-resistant Gen 2 Kloak Mister with a Mossy Oak Break-up Country exterior, features a raised rubber-coated power button and delay selection button, visible power and setting lights that auto dim to avoid visual detection, slide-latch for the battery/cartridge door, and a see-through window to view the content level of the scent cartridge inside. The system comes with a USB cable for battery charging, one 2.5-ounce Earth Concealment Mist cartridge, and a lanyard for conveniently carrying or hanging the unit from a stand, or tree limb. The compact, lightweight Gen 2 Kloak Mister delivers a powerful advantage to any hunter by offering guaranteed fresh scent at timed intervals throughout the entire hunt. Whether using it for concealment or luring deer, hogs or bear to your area and keeping them in range longer, the mister raises the odds of a successful harvest. Mossy Oak is a trademark used under license from Haas Outdoors, Inc., by The Gyde Group, LLC. If you have any questions about this product by Hunter's Kloak, contact us by completing and submitting the form below. If you are looking for a specif part number, please include it with your message.